Entrepreneurs have ideas but need money to make those ideas happen. Angel investors have money but need entrepreneurs they can trust with their money. Grand Canyon University has become an entrepreneurial hub of Arizona, with a focus on the principles of Conscious Capitalism. 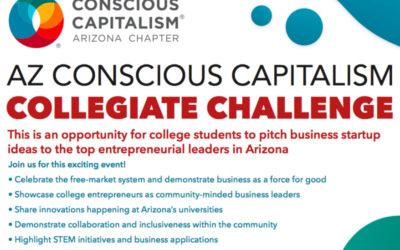 On Wednesday, GCU Arena will be host to two first-time (and free) events that should benefit college entrepreneurs and investors alike: an angel investment educational seminar at 2 p.m., followed by the AZ Conscious Capitalism Collegiate Challenge at 4 p.m. They go hand in hand. First, the investors get tips on wisely choosing a startup that needs their help, and then they get to listen to some of the best young entrepreneurs in the state – who, in turn, will be competing for financial and mentoring assistance, but with a rewards system that spreads the wealth. Unlike GCU’s Canyon Challenge in late March, which awarded prizes to the top three finishers, the Collegiate Challenge features 18 prizes totaling more than $40,000. The awards include up to $5,000 in cash, a 12-month workplace ($7,800 value), various workshops and memberships, and even an executive business chair. That’s a lot of incentive for the 10 teams – two apiece from GCU, the University of Arizona and Arizona State University and one each from Northern Arizona University, Embry-Riddle Aeronautical University, GateWay Community College and Paradise Valley Community College. But here’s the catch: The company that donated each prize can give it to whichever entrant it thinks is the most deserving – and most worthy of the investment. 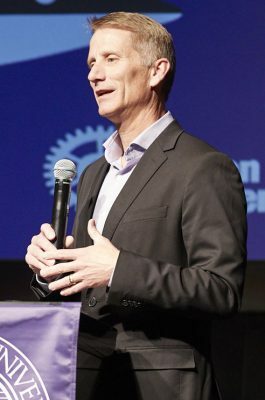 GCU’s two entrants will be Canyon Challenge finalists Prophet Insight, which uses artificial intelligence to provide location-based analysis for small- and medium-size businesses, and Lux Longboard Rentals, which rents electric longboards and scooters. The Canyon Challenge winner, Elroi & Men, was ineligible for the Collegiate Challenge because its creator, Andrea Northup, is a GCU graduate. 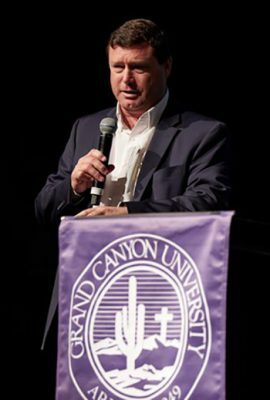 The Canyon Challenge is open to GCU alumni, whereas at least 50 percent of each AZ Conscious Capitalism team must be composed of undergraduate students for Wednesday’s event. The 2 p.m. event Wednesday is designed to reach out to the 140,000 people in the Valley who qualify as accredited investors (net worth of more than a million dollars outside their residence). People who have been that successful in the business world love to find new investments, but Tim Kelley, assistant professor of Entrepreneurship and Economics at GCU, said the combined membership of the angel investing groups is fewer than 500. “Those people are getting hit up by entrepreneurs all the time – you know, your rich uncle,” said Kelley, who will lead the event. “They don’t have a way in which to filter those things out in a professional way. We’re here. We’re angel groups. We have an infrastructure to do due diligence. We can evaluate them based on specific metrics. The board of Conscious Capitalism Arizona (CCAZ), of which Gibb is a member, is determined to further that type of thinking. The idea behind Conscious Capitalism is to do business with a higher purpose and make employees stakeholders by dramatically increasing pay and productivity. In McIntosh’s view, too many business colleges focus on profit maximization, which he equates to “short-term thinking.” GCU, on the other hand, is “a natural fit for what Conscious Capitalism is” because of its focus on servant leadership. But he believes things are changing because students today are more focused on purpose, and that leads them straight into the Conscious Capitalism credo. The goal is to make Arizona a hub for a national movement. It’s already ahead of the game – it was the third chapter ever created. But, again, the investors have to be part of it, too. More little gems could be on display in Wednesday’s “doubleheader.” It’s time for investors and entrepreneurs to play ball.